We welcome articles of up to 5000 words that highlight research and issues connected with self-access learning or skills support centres. The articles should be scholarly, yet generally accessible to ELT professionals, highlighting practical applications where possible. 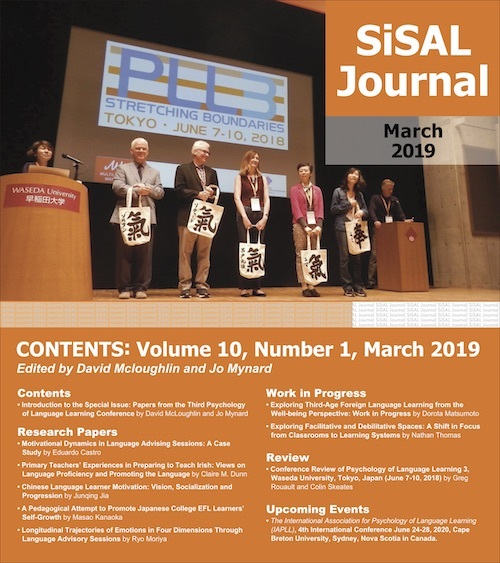 Articles should be of interest and relevance to the readers of SiSAL Journal. Articles should be well written and proofread by at least one peer before submission. SiSAL Journal may also consider reprinting previously published articles if permission is obtained from the original copyright holder. Short summaries and progress reports of no more than 1500 words are welcome. References are not necessary. General opinion pieces and reflections on research or practice of around 2000 words are welcome. Reviews of events and conferences, academic books or articles, self-access materials or useful websites of around 1000 words are welcome. Read more details. Examples of self-access resources with accompanying explanations are also welcome. Articles may be submitted in any language, but an English summary of around 200 words must accompany the original manuscript. When preparing your English manuscript, please use British English or American English (be consistent) and follow the style guidelines indicated in this example article for authors (updated July 2018 based on APA 6th edition). Many authors find this website useful for APA conventions. The authors retain copyright over their work under a creative commons 3.0 agreement and may submit it for publication elsewhere. SiSAL Journal retains the right to publish the journal in multiple formats to maximise exposure. Please send articles, reports, opinions, reflections, reviews and works in progress for upcoming issues. Issues of SiSAL Journal are published in March, June, September and December of each year. Currently, authors can expect accepted articles to be published within six months of submission. Special issue on selected papers from the Psychology of Language Learning Conference 3 (PLL3 http://www.pll3-tokyo2018.com/) edited by Jo Mynard and David McLoughlin. Copyright © 2018 Studies in Self-Access Learning Journal, ISSN 2185-3762.